The class that provides all functions necessary to evaluate functions at quadrature points and cell integrations. In functionality, this class is similar to FEValues, however, it includes a lot of specialized functions that make it much faster (between 5 and 500, depending on the polynomial degree). For evaluation of face terms in DG, see the class FEFaceEvaluation. The first and foremost way of usage is to initialize this class from a MatrixFree object that caches everything related to the degrees of freedom and the mapping information. This way, it is possible to use vectorization for applying a differential operator for several cells at once. Likewise, a gradient of the finite element solution represented by vector can be interpolated to the quadrature points by phi.get_gradient(q). The combination of read_dof_values(), evaluate() and get_value() is similar to what FEValues::get_function_values or FEValues::get_function_gradients does, but it is in general much faster because it makes use of the tensor product, see the description of the evaluation routines below, and can do this operation for several cells at once through vectorization. In this code, the call to phi.submit_value() prepares for the multiplication by the test function prior to the actual integration (inside the submit call, the value to be tested is also multiplied by the determinant of the Jacobian and the quadrature weight). In the integrate() call, an integral contribution tested by each basis function underlying the FEEvaluation object (e.g. the four linear shape functions of FE_Q<2>(1) in 2D) is computed, which gives the vector entries to be summed into the dst vector. Note that the above code needs to explicitly loop over the components in the vectorized array for evaluating the function, which is necessary for interfacing with a generic Function object with double arguments. Simple functions can also be implemented in VectorizedArray form directly as VectorizedArray provides the basic math operations. For evaluating a bilinear form, the evaluation on a source vector is combined with the integration involving test functions that get written into a result vector. This setting is the context of matrix-free operator evaluation and explained in the step-37 and step-48 tutorial programs. Note that the two vector accesses through FEEvaluation::read_dof_values and FEEvaluation::distribute_local_to_global resolve constraints on the fly, based on the AffineConstraints object specified at the MatrixFree::reinit() call. In case the values in the degrees of freedom are of interest (usually only the values in quadrature points are necessary), these can be accessed through FEEvaluation::get_dof_value(i), where i is the index of the basis function. Note that the numbering of the degrees of freedom for continuous elements in FEEvaluation is different from the ordering in FE_Q (or FEValues) because FEEvaluation needs to access them in lexicographic order, which is the ordering used in FE_DGQ, for instance. Re-indexing would be too expensive because the access inside evaluate() and integrate() is on the critical path in the tensorial evaluation parts. An alternative to filling the DoF values by read_dof_values() before an evaluate() call is to manually assign a value by a set_dof_value() call. Likewise, if the local result of integration should be further processed rather than scattered into a vector by distribute_local_to_global(), one can access it by get_dof_value() after an integrate() call. An example for using the values of an integral in a different context is fast assembly of matrices as shown in the next subsection. For most operator evaluation tasks that repeatedly go through the mesh, the realization by MatrixFree that combines pre-computed data for the mapping (Jacobian transformations for the geometry description) with on-the-fly evaluation of basis functions is the most efficient way of doing things. In other words, the framework selects a trade-off between memory usage and initialization of objects that is suitable for replacement of matrix-vector products or explicit time integration in a matrix-free way. The second form of usage is to initialize FEEvaluation from geometry information generated by FEValues. This allows to apply the integration loops on the fly without prior initialization of MatrixFree objects. This can be useful when the memory and initialization cost of MatrixFree is not acceptable, e.g. when a different number of quadrature points should be used for one single evaluation in error computation. Also, when using the routines of this class to assemble matrices the trade-off implied by the MatrixFree class may not be desired. In such a case, the cost to initialize the necessary geometry data on the fly is comparably low and thus avoiding a global object MatrixFree can be useful. When used in this way, reinit methods reminiscent from FEValues with a cell iterator are used. However, note that this model results in working on a single cell at a time, with geometry data duplicated in all components of the vectorized array. Thus, vectorization is only useful when it can apply the same operation on different data, e.g. when performing matrix assembly. This code generates the columns of the cell matrix with the loop over i above. The way this is done is the following: FEEvaluation's routines focus on the evaluation of finite element operators, so for computing a cell matrix out of an operator evaluation it is applied to all the unit vectors on the cell. Applying the operator on a unit vector might seem inefficient but the evaluation routines used here are so quick that they still work much faster than what is possible with FEValues. In particular, the complexity is (fe_degree+1)2*dim+1 rather than (fe_degree+1)3*dim . Due to vectorization, we can generate matrix columns for several unit vectors at a time (e.g. 4). The variable n_items make sure that we do the last iteration where the number of cell dofs is not divisible by the vectorization length correctly. Also note that we need to get the internal dof numbering applied by fe_eval because FEEvaluation internally uses a lexicographic numbering of degrees of freedom as explained above. The temporary data for holding the solution values on the local degrees of freedom as well as the interpolated values, gradients, and Hessians on quadrature points is a scratch array provided by MatrixFree::acquire_scratch_data() that is re-used between different calls to FEEvaluation. Therefore, constructing an FEEvaluation object is typically cheap and does not involve any expensive operation. Only a few dozen pointers to the actual data fields are set during construction. Therefore, no negative performance impact arises when creating an FEEvaluation several times per loop, such as at the top of a local_cell_operation operation that is split in small chunks for a parallel for loop, obviating a separate scratch data field for parallel loops as necessary in the loop of WorkStream. When using the FEEvaluation class in multithreaded mode, the thread local storage of the scratch data in MatrixFree automatically makes sure that each thread gets it private data array. Note, however, that deal.II must be compiled with thread support also when all the thread parallelization is provided externally and not done via deal.II's routines, such as OpenMP. This is because deal.II needs to know the notation of thread local storage. The FEEvaluation kernels have been verified to work within OpenMP loops. This class is designed to perform all arithmetics on single-instruction multiple-data (SIMD) instructions present on modern CPUs by explicit vectorization, which are made available in deal.II through the class VectorizedArray, using the widest vector width available at configure/compile time. In order to keep programs flexible, FEEvaluation always applies vectorization over several elements. This is often the best compromise because computations on different elements are usually independent in the finite element method (except of course the process of adding an integral contribution to a global residual vector), also in more complicated scenarios: Stabilization parameter can e.g. be defined as the maximum of some quantities on all quadrature points of a cell divided by the cell's volume, but without locally mixing the results with neighbors. Using the terminology from computer architecture, the design of FEEvaluation relies on not doing any cross-lane data exchange when operating on the cell in typical integration scenarios. When the number of cells in the problem is not a multiple of the number of array elements in the SIMD vector, the implementation of FEEvaluation fills in some dummy entries in the unused SIMD lanes and carries them around nonetheless, a choice made necessary since the length of VectorizedArray is fixed at compile time. Yet, this approach most often results in superior code as compared to an auto-vectorization setup where an alternative unvectorized code path would be necessary next to the vectorized version to be used on fully populated lanes, together with a dispatch mechanism. In read_dof_values, the empty lanes resulting from a reinit() call to an incomplete batch of cells are set to zero, whereas distribute_local_to_global or set_dof_values simply ignores the content in the empty lanes. The number of actually filled SIMD lanes can by queried by MatrixFree::n_components_filled(). Obviously, the computations performed on the artificial lanes (without real data) should never be mixed with valid results. The contract in using this class is that the user makes sure that lanes are not crossed in user code, in particular since it is not clear a priori which cells are going to be put together in vectorization. For example, results on an element should not be added to results on other elements except through the global vector access methods or by access that is masked by MatrixFree::n_components_filled(). No guarantee can be made that results on artificial lanes will always be zero that can safely be added to other results: The data on JxW or Jacobians is copied from the last valid lane in order to avoid division by zero that could trigger floating point exceptions or trouble in other situations. This class contains specialized evaluation routines for elements based on tensor-product quadrature formulas and tensor-product-like shape functions, including standard FE_Q or FE_DGQ elements and quadrature points symmetric around 0.5 (like Gauss quadrature), FE_DGP elements based on truncated tensor products as well as the faster case of Gauss-Lobatto elements with Gauss-Lobatto quadrature which give diagonal mass matrices and quicker evaluation internally. The main benefit of this class is the evaluation of all shape functions in all quadrature or integration over all shape functions in dim (fe_degree+1)dim+1 operations instead of the slower (fe_degree+1)2*dim complexity in the evaluation routines of FEValues. This is done by an algorithm called sum factorization which factors out constant factors during the evaluation along a coordinate direction. This algorithm is the basis of many spectral element algorithms. Note that many of the operations available through this class are inherited from the base class FEEvaluationBase, in particular reading from and writing to vectors. Also, the class inherits from FEEvaluationAccess that implements access to values, gradients and Hessians of the finite element function on quadrature points. This class assumes that the shape functions of the FiniteElement under consideration do not depend on the geometry of the cells in real space. Currently, other finite elements cannot be treated with the matrix-free concept. The default usage model of FEEvaluation expects the polynomial degree to be given as a template parameter. This requirement guarantees maximum efficiency: The sum factorization evaluation performs a number of nested short 1D loops of length equal to the polynomial degree plus one. If the loop bounds are known at compile time, the compiler can unroll loops as deemed most efficient by its heuristics. At least the innermost loop is almost always completely unrolled, avoiding the loop overhead. However, carrying the polynomial degree (and the number of quadrature points) as a template parameter makes things more complicated in codes where different polynomial degrees should be considered, e.g. in application codes where the polynomial degree is given through an input file. The recommended approach for good performance is to create different cell functions, possibly through different operator classes that are derived from a common base class with virtual functions to access the operator evaluation. The program then keeps only a pointer to the common base class after initializing templated derived classes with fixed polynomial degree that are selected from the detected polynomial degree. This approach requires a-priori knowledge of the range of valid degrees and can lead to rather long compile times in programs with many apply functions. A flexible choice of the polynomial degree based on the information in the element passed to the initialization is also supported by FEEvaluation, even though it runs two to three times more slowly. For this, set the template parameter for the polynomial degree to -1 (and choose an arbitrary number for the number of quadrature points), which switches to the other code path. Internally, an evaluator object with template specialization for -1 is invoked that runs according to run-time bounds, whereas the default case with compile-time bounds given through fe_degree selects another template class without compromising efficiency. An overview of the performance of FEEvaluation is given in the following figure. It considers the time spent per degree of freedom for evaluating the Laplacian with continuous finite elements using a code similar to the step-37 tutorial program for single-precision arithmetics. The time is based on an experiment on a single core of an Intel Xeon E5-2687W v4, running at 3.4 GHz and measured at problem sizes around 10 million. The plot lists the computational time (around 0.1 seconds) divided by the number of degrees freedom. 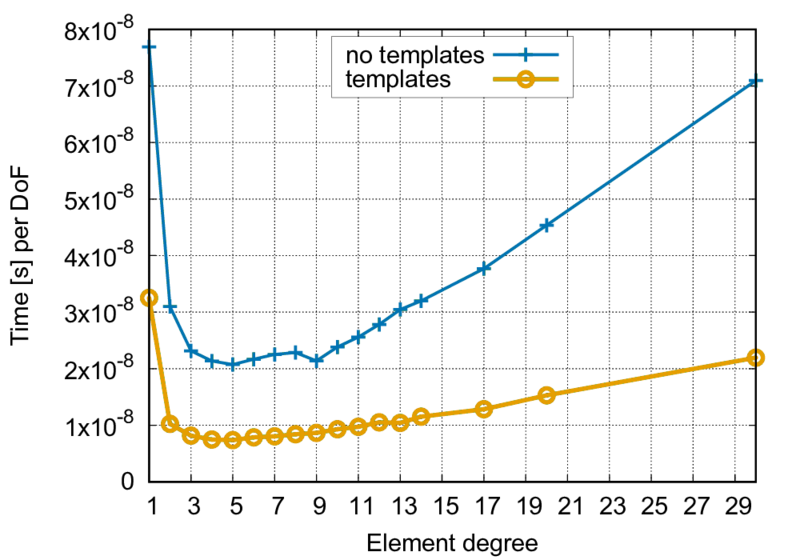 The figure shows that the templated version is between 2.5 and 3 times faster. The fastest turnaround on this setup is for polynomial degree 5 at 7.4e-9 seconds per degree of freedom or 134 million degrees of freedom per second - on a single core. The non-templated version is also fastest at polynomial degree 5 with 2.1e-9 seconds per degree of freedom or 48 million degrees of freedom per second. where the 0 means that the vectors starting from the zeroth vector in the std::vector should be used, src, src, ..., src[n_components-1]. An alternative way for reading multi-component systems is possible if the DoFHandler underlying the MatrixFree data is based on an FESystem of n_components entries. In that case, a single vector is provided for the read_dof_values() and distribute_local_to_global() calls. In a similar vein, the submit_value() and submit_gradient() calls take tensors of values. Note that there exist specializations for n_components=1 and n_components=dim, which are provided through the base class FEEvaluationAccess. In the scalar case, these provide the scalar return types described above. In the vector-valued case, the gradient is converted from Tensor<1,dim,Tensor<1,dim,VectorizedArray<double> > > to Tensor<2,dim,VectorizedArray<double> >. Furthermore, additional operations such as the diveregence or curl are available. In the loop over quadrature points, one can ask any of the two FEEvaluation objects — it does not really matter which one because they only keep pointers to the quadrature point data — to provide the quadrature point location. This observation also translates to the case when different differential operators are implemented in a program, for example the action of a mass matrix for one phase of the algorithm and the action of a stiffness matrix in another one. Only a single MatrixFree object is necessary, maintaining full efficiency by using different local functions with the respective implementation in separate FEEvaluation objects. In other words, a user does not need to bother about being conservative when providing update_flags to the initialization of MatrixFree for efficiency reasons - no overhead incurs inside FEEvaluation, except for at most one or two more if statements inside the FEEvaluation::reinit() call. Rather, the largest set of flags necessary among all calls is perfectly fine from an efficiency point of view. For the combination of different fields, including different solution vectors that come from different time steps, it is mandatory that all FEEvaluation objects share the same MatrixFree object. This is because the way cells are looped by MatrixFree::cell_loop() can be different for different DoFHandler or AffineConstraints arguments. More precisely, even though the layout is going to be the same in serial, there is no guarantee about the ordering for different DoFHandler/AffineConstraints in the MPI case. The reason is that the algorithm detects cells that need data exchange with MPI and those can change for different elements — FE_Q with hanging node constraints connects to more neighbors than a FE_DGQ element, for instance, and cells which need data exchange are put in different positions inside the cell loop. Of course, if the exact same DoFHandler, AffineConstraints, and options (such as the setting for thread parallelism) are set, then the order is going to be the same because the algorithm is deterministic. fe_degree Degree of the tensor product finite element with fe_degree+1 degrees of freedom per coordinate direction. Can be set to -1 if the degree is not known at compile time, but performance will usually be worse by a factor of 2-3.
n_components Number of vector components when solving a system of PDEs. If the same operation is applied to several components of a PDE (e.g. a vector Laplace equation), they can be applied simultaneously with one call (and often more efficiently). Defaults to 1. Definition at line 55 of file fe_evaluation.h. An alias to the base class. Definition at line 2169 of file fe_evaluation.h. An underlying number type specified as template argument. Definition at line 2174 of file fe_evaluation.h. The type of function values, e.g. VectorizedArray<Number> for n_components=1 or Tensor<1,dim,VectorizedArray<Number> > for n_components=dim. Definition at line 2181 of file fe_evaluation.h. The type of gradients, e.g. Tensor<1,dim,VectorizedArray<Number>> for n_components=1 or Tensor<2,dim,VectorizedArray<Number> > for n_components=dim. Definition at line 2188 of file fe_evaluation.h. Constructor. Takes all data stored in MatrixFree. If applied to problems with more than one finite element or more than one quadrature formula selected during construction of matrix_free, the appropriate component can be selected by the optional arguments. dof_no If matrix_free was set up with multiple DoFHandler objects, this parameter selects to which DoFHandler/AffineConstraints pair the given evaluator should be attached to. quad_no If matrix_free was set up with multiple Quadrature objects, this parameter selects the appropriate number of the quadrature formula. first_selected_component If the dof_handler selected by dof_no uses an FESystem consisting of more than one component, this parameter allows for selecting the component where the current evaluation routine should start. Note that one evaluator does not support combining different shape functions in different components. In other words, the same base element of a FESystem needs to be set for the components between first_selected_component and first_selected_component+n_components_. Constructor that comes with reduced functionality and works similar as FEValues. The arguments are similar to the ones passed to the constructor of FEValues, with the notable difference that FEEvaluation expects a one- dimensional quadrature formula, Quadrature<1>, instead of a dim dimensional one. The finite element can be both scalar or vector valued, but this method always only selects a scalar base element at a time (with n_components copies as specified by the class template). For vector- valued elements, the optional argument first_selected_component allows to specify the index of the base element to be used for evaluation. Note that the internal data structures always assume that the base element is primitive, non-primitive are not supported currently. As known from FEValues, a call to the reinit method with a Triangulation<dim>::cell_iterator is necessary to make the geometry and degrees of freedom of the current class known. If the iterator includes DoFHandler information (i.e., it is a DoFHandler<dim>::cell_iterator or similar), the initialization allows to also read from or write to vectors in the standard way for DoFHandler<dim>::active_cell_iterator types for one cell at a time. However, this approach is much slower than the path with MatrixFree with MPI since index translation has to be done. As only one cell at a time is used, this method does not vectorize over several elements (which is most efficient for vector operations), but only possibly within the element if the evaluate/integrate routines are combined inside user code (e.g. for computing cell matrices). Constructor for the reduced functionality. This constructor is equivalent to the other one except that it makes the object use a \(Q_1\) mapping (i.e., an object of type MappingQGeneric(1)) implicitly. Constructor for the reduced functionality. Similar to the other constructor with FiniteElement argument but using another FEEvaluationBase object to provide information about the geometry. This allows several FEEvaluation objects to share the geometry evaluation, i.e., the underlying mapping and quadrature points do only need to be evaluated once. Make sure to not pass an optional object around when you intend to use the FEEvaluation object in parallel to the given one because otherwise the intended sharing may create race conditions. Copy constructor. If FEEvaluationBase was constructed from a mapping, fe, quadrature, and update flags, the underlying geometry evaluation based on FEValues will be deep-copied in order to allow for using in parallel with threads. Copy assignment operator. If FEEvaluationBase was constructed from a mapping, fe, quadrature, and update flags, the underlying geometry evaluation based on FEValues will be deep-copied in order to allow for using in parallel with threads. Initialize the operation pointer to the current cell batch index. Unlike the reinit functions taking a cell iterator as argument below and the FEValues::reinit() methods, where the information related to a particular cell is generated in the reinit call, this function is very cheap since all data is pre-computed in matrix_free, and only a few indices have to be set appropriately. Initialize the data to the current cell using a TriaIterator object as usual in FEValues. The argument is either of type DoFHandler::active_cell_iterator or DoFHandler::level_cell_iterator. This option is only available if the FEEvaluation object was created with a finite element, quadrature formula and correct update flags and without a MatrixFree object. This initialization method loses the ability to use vectorization, see also the description of the FEEvaluation class. When this reinit method is used, FEEvaluation can also read from vectors (but less efficient than with data coming from MatrixFree). Initialize the data to the current cell using a TriaIterator object as usual in FEValues. This option is only available if the FEEvaluation object was created with a finite element, quadrature formula and correct update flags and without a MatrixFree object. This initialization method loses the ability to use vectorization, see also the description of the FEEvaluation class. When this reinit method is used, FEEvaluation can not read from vectors because no DoFHandler information is available. Evaluate the function values, the gradients, and the Hessians of the polynomial interpolation from the DoF values in the input vector to the quadrature points on the unit cell. The function arguments specify which parts shall actually be computed. This function has to be called first so that the access functions get_value(), get_gradient() or get_laplacian give useful information (unless these values have been set manually). Evaluate the function values, the gradients, and the Hessians of the polynomial interpolation from the DoF values in the input array values_array to the quadrature points on the unit cell. If multiple components are involved in the current FEEvaluation object, the sorting in values_array is such that all degrees of freedom for the first component come first, then all degrees of freedom for the second, and so on. The function arguments specify which parts shall actually be computed. This function has to be called first so that the access functions get_value(), get_gradient() or get_laplacian give useful information (unless these values have been set manually). Read from the input vector and evaluates the function values, the gradients, and the Hessians of the polynomial interpolation of the vector entries from input_vector associated with the current cell to the quadrature points on the unit cell. The function arguments specify which parts shall actually be computed. This function has to be called first so that the access functions get_value(), get_gradient() or get_laplacian give useful information (unless these values have been set manually). This call is equivalent to calling read_dof_values() followed by evaluate(), but might internally use some additional optimizations. This function takes the values and/or gradients that are stored on quadrature points, tests them by all the basis functions/gradients on the cell and performs the cell integration. The two function arguments integrate_values and integrate_gradients are used to enable/disable summation of the contributions submitted to the values or gradients slots, respectively. The result is written into the internal data field dof_values (that is usually written into the result vector by the distribute_local_to_global() or set_dof_values() methods). This function takes the values and/or gradients that are stored on quadrature points, tests them by all the basis functions/gradients on the cell and performs the cell integration. The two function arguments integrate_values and integrate_gradients are used to enable/disable summation of the contributions submitted to the values or gradients slots, respectively. As opposed to the other integrate() method, this call stores the result of the testing in the given array values_array, whose previous results is overwritten, rather than writing it on the internal data structures behind begin_dof_values(). This function takes the values and/or gradients that are stored on quadrature points, tests them by all the basis functions/gradients on the cell, performs the cell integration, and adds the result into the global vector output_vector on the degrees of freedom associated with the present cell index. The two function arguments integrate_values and integrate_gradients are used to enable/disable summation of the contributions submitted to the values or gradients slots, respectively. This call is equivalent to calling integrate() followed by distribute_local_to_global(), but might internally use some additional optimizations. Return the q-th quadrature point in real coordinates stored in MappingInfo. Checks if the template arguments regarding degree of the element corresponds to the actual element used at initialization. The dimension given as template argument. Definition at line 2193 of file fe_evaluation.h. The number of solution components of the evaluator given as template argument. Definition at line 2199 of file fe_evaluation.h. The static number of quadrature points determined from the given template argument n_q_points_1d. Note that the actual number of quadrature points, n_q_points, can be different if fe_degree=-1 is given and run-time loop lengths are used rather than compile time ones. Definition at line 2207 of file fe_evaluation.h. The static number of degrees of freedom of a scalar component determined from the given template argument fe_degree. Note that the actual number of degrees of freedom dofs_per_component can be different if fe_degree=-1 is given or if the underlying is of more complicated type than the usual FE_Q or FE_DGQ ones, such as FE_DGP. Definition at line 2217 of file fe_evaluation.h. The static number of degrees of freedom of all components determined from the given template argument fe_degree. Note that the actual number of degrees of freedom dofs_per_cell can be different if fe_degree=-1 is given or if the underlying is of more complicated type than the usual FE_Q or FE_DGQ ones, such as FE_DGP. Definition at line 2227 of file fe_evaluation.h. Definition at line 2237 of file fe_evaluation.h. The number of degrees of freedom of a single component on the cell for the underlying evaluation object. Usually close to static_dofs_per_component, but the number depends on the actual element selected and is thus not static. Definition at line 2498 of file fe_evaluation.h. The number of degrees of freedom on the cell accumulated over all components in the current evaluation object. Usually close to static_dofs_per_cell = static_dofs_per_component*n_components, but the number depends on the actual element selected and is thus not static. Definition at line 2506 of file fe_evaluation.h. The number of quadrature points in use. If the number of quadrature points in 1d is given as a template, this number is simply the dim-th power of that value. If the element degree is set to -1 (dynamic selection of element degree), the static value of quadrature points is inaccurate and this value must be used instead. Definition at line 2515 of file fe_evaluation.h.